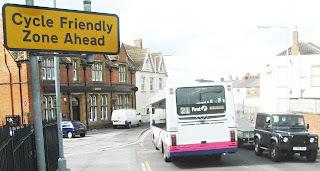 Unless more is done than erect signage, it can sometimes be difficult to tell a "cycle friendly" zone in the UK from one which is less "cycle friendly". The photo shows a sign in Highbridge, Somerset, England. It was taken a couple of weeks ago by a friend passing through who had seen this arrangement of "cycle friendly" sign and lots of traffic and thought it funny. As it turned out, this sign is in a place which has some significance for us. Some years ago, my wife and I had our first home together just a couple of hundred metres from this sign. Years before that, this road was part of my cycle route to work. It wasn't always particularly pleasant to cycle along here, however I was part of that small minority who get around by bike even if the conditions are not good. In 2006, with a friend, I passed this spot on my ride between Land's End and John o'Groats. This point is between my parents' and my sister's home. They only live 10 miles (16 km) apart from each other, which is a short distance by bike, but it may as well be a thousand miles when there are obstacles like this in the way. What could be nicer than grand-children cycling over to see their grand-parents, or the whole family going on bike rides together with a picnic. If this was the Netherlands, such things would be possible. However, in Britain it is not possible. The lack of proper cycling infrastructure means that my nieces have grown into adults without ever making that journey, and that my parents would never consider riding in the opposite direction either (even though they find riding here to be very pleasant). Riding in this location is something that few would encourage their loved ones to do. I don't criticise anyone for not cycling in conditions like this. If I still lived there I also wouldn't be encouraging my children to cycle their journeys. In fact, I might have stopped cycling myself by now too. That's what people do. I've met any number of people in Britain who cycled when they were young, but gave up as they got older, including friends of a similar age to myself. If conditions are not pleasant, people don't tend to cycle. Riding along the busy A38 and through cramped areas like that shown are enough to stop virtually everyone from riding, and the result is that despite this area of Somerset being just as flat as much of the Netherlands, the cycling rate is very much lower. Close to zero. Over here it's very different. It's always pleasant to make such journeys by bike, and that's what everyone does. My children regularly make longer journeys than this to visit their friends. Not only does this mean my children have far more freedom because we moved to the Netherlands, but it also means that Mum and Dad are free from having to act as taxis. The habit isn't lost as people age, either. Even the over 60s make 24% of their journeys by bike. For cycling to increase in popularity in the UK, provision for British cyclists needs to move well beyond just putting up a few signs. So long as infrastructure puts cyclists in the way of drivers, cycling will remain a minority pursuit. A high degree of subjective safety is vital if the habit of cycling is to be encouraged and retained as people get older. We're not traffic calming, we're people. While this location was particularly interesting to us because of our connection to the area, the situation is far from unique. There are thousands of locations across the UK which look a lot like this. Thousands of locations that put off all but the most keen cyclists. By comparison, take a look at the way a Dutch city has been changed over time, or look at a typical route between towns. We're running Study Tours over here for councillors, campaigners, planners from the UK to come and experience the difference between cycling in the Netherlands and cycling in the UK, and to see for themselves what the results are in numbers of people cycling.